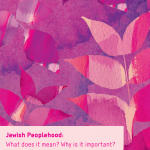 Check out the new media resources in the CJPE Toolkit for Jewish Educators. We are curating and organizing selections of short video clips that educators can use to explore the themes of Jewish Peoplehood. With each video clip we also offer you suggestions for activities to use with those clips, and all part of our interconnected Toolkit site. Check out the new media resources connected to the themes of Collective Belonging and Mutual Responsibility. And keep coming back to the Toolkit to find new materials!